As promised, the peppers have joined all the other vegetables in the rooftop garden. 4 orange and 4 yellow bell pepper plants are in the Grow Box self-watering container in the center, the jalapeno is in the 12" container on the right and my 1 red/green bell pepper is in the 12" container on the left. The tomato plants are doing much better. I guess the black plastic mulch really helped, I see no new signs of phosphorus deficiency. Yay! I've got to admire someone who gardens on a tarred roof. Thanks for "following" me - looking forward to sharing experiences. Your peppers look pretty happy. I grew some in a grow box last year on my deck and they did very well into October! 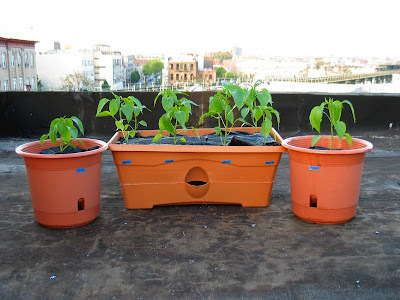 Sub-irrigated planters on a tar roof are a lot better than edible plants growing in a lead mine.